Implants are a remarkable procedure. 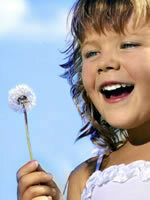 Implants can replace any or all of your teeth. The implant becomes integrated with your bone and acts like a bolt which ultimately supports a new tooth. Some of the advantages of implants for patients who wear dentures are denture stability, increased ability to chew and enjoy their food along with increased patient comfort, appearance and confidence. The surgery and restoration of the implant are both performed by Dr. Dunn. Root form implants are the most popular type of implants used in dentistry today. These implants can be either a screw shaped or cylinder shaped implant. They are used when there is sufficient height and width of bone to accommodate the implant. These implants can be used in all areas of the mouth. 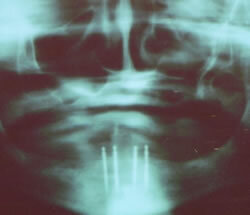 These are 1.8 mm diameter implants that can be placed in your lower jaw. It is a one step procedure that involves minimally invasive surgery and no sutures. The indication for these implants are for patients that have an existing lower denture that they cannot keep stable in their mouth due to severe resorbtion of their jaw. In about two hours the implants can be placed and your existing lower denture retrofitted to the implants. There is usually minimal discomfort after the procedure that can be controlled with Advil or Tylenol. There is no waiting time. You can eat immediately. There are several accredited bone tissue banks in our country. The American Red Cross is one of them. These tissue banks are where we obtain the bone that we use for patients who need grafting procedures. This procedure is used to generate additional bone at implant sites that do not have enough width or height of bone to accommodate root form implants. When a tooth is removed that is going to have an implant placed after the extraction site has sufficiently healed a bone grafting procedure is performed at the time of the extraction to preserve the height and width of the bone. Even with completely normal healing there is some resorption or loss of bone and gum resulting in less height and width than were present prior to the tooth extraction. If this procedure isn't performed as much as 25% of the width of bone can be lost within one year. How Are Root Form Dental Implants Placed? If you are considering a dental implant, Contact Us for an evaluation appointment. Dr. Dunn or Dr. Castro will perform an evaluation to determine whether you are a good candidate for a dental implant. If you are a good candidate for an implant, Dr. Dunn or Dr. Castro will provide you with further information to help you decide.